More than 30 years ago, all of Red Butte Canyon’s beavers were killed. Some Utah professors say now is the time to bring them back. (Trent Nelson | The Salt Lake Tribune) A beaver dam near the 17th hole at Mountain Dell Golf Course, Friday, May 25, 2018. Back in 1982, Red Butte Canyon’s 78 beavers were killed under the pretext that the dam-building rodents were a vector for giardia, a dreaded parasite responsible for gastrointestinal stress around the world. At the time, the U.S. Army relied on a reservoir on Red Butte Creek for drinking water at Fort Douglas, just east of the University of Utah campus. Jim Ehleringer, a U. biology professor, recalls arguing with the fort’s new commander that beavers belonged there and other mammals could also carry giardia. He felt eradicating them would not accomplish much other than degrading the ecology of the canyon, which had been a research natural area administered by the U.S. Forest Service for more than a decade. Now some U. biology faculty members led by Pat Shea, a Salt Lake City attorney, hope to re-establish beavers to restore natural processes and conduct research into how the environment would respond to new beaver dams that slow the passage of water and create wetlands. But for Greg Lee, who oversees the U.’s botanical garden at the mouth of the canyon, it’s a no-brainer to carefully consider what could go wrong. 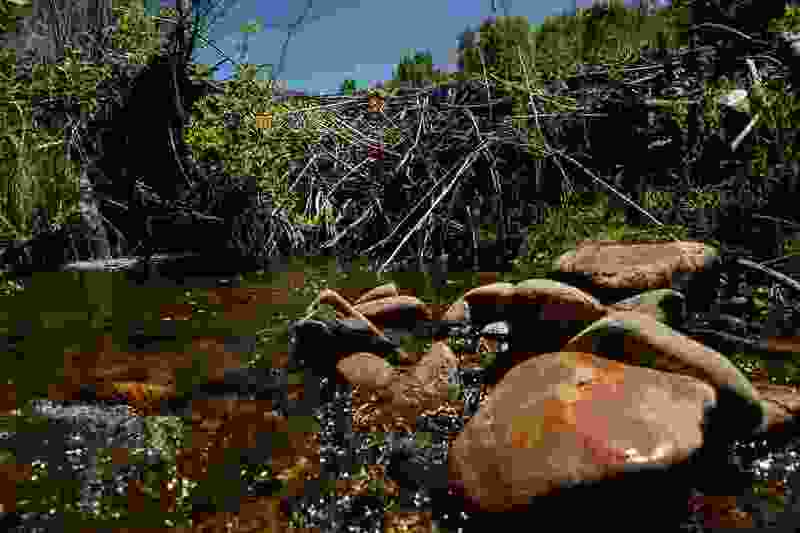 Proponents say the chances are small for beavers to infiltrate the garden, whose fenced border is a few hundred meters downstream from the Red Butte Canyon Research Natural Area’s own fence line, protected with a locked gate. Beaver movements would be monitored and animals could be promptly trapped if they got near the garden, said Shea, who has agreed to buy insurance to cover potential beaver damage. A former head of the Bureau of Land Management in the Clinton administration, Shea holds an associate research professor appointment with the U. biology department and teaches a course about the canyon titled The Biography of an Urban Stream. For nearly a half century, the 5,140-acre preserve sandwiched between City Creek and Emigration canyons has been managed for research and kept off-limits to the public, despite its immediate proximity to Utah’s largest urban area. The woods provide crucial cover for migratory songbirds, whose movements are carefully monitored by U. researchers and volunteers. Whatever risks arise from the beavers’ return would be outweighed by the restoration benefits and research opportunities, Shea contends. The winter of 1982-83, immediately after the beavers’ eviction, was among the wettest on record, and runoff pushed debris into Red Butte Reservoir, forming a peninsula that remains to this day. The reservoir underscores the fact that the canyon isn’t all that pristine. In pioneer times, sheep and cattle grazed there; later it was mined and quarried for construction stones, some of which were used in what is now Salt Lake City Hall; then it was a stage for military training. The angst over Shea’s plan highlights Westerners‘ ambivalence toward beavers, treated as a both a nuisance and a valuable furbearer. No species of wildlife has a larger capacity for altering the landscape than this critter known as nature’s engineer. The beavers’ dam building thins trees and creates soggy habitats for other animals, but such “ecosystem services” are a nightmare when those wetlands encroach on roads and fill basements, clog culverts and wipe out cherished trees. While Red Butte Garden celebrates nature, it is hardly a natural place. Its plants are carefully arranged in manicured beds, and the garden is now better known as a venue for weddings and outdoor concerts. Beavers and other wild mammals, including unsupervised children, can make a hash of the garden’s ordered plant communities in no time. Promises to remove wayward beavers hold little comfort for Lee. Shea’s plan would use animals state officials remove from places where they are causing problems. The Division of Wildlife Resources would release them into the canyon after a 72-hour quarantine. Beavers can be a great tool for restoring wetlands, but it is essential that projects secure buy-in from all stakeholders and funding is set aside to monitor for potential problems and address them immediately, according to Joe Wheaton, a professor of watershed science at Utah State University. “Beavers do all this stuff for free. There are certain places where they can do good, but it’s complicated. It’s tricky to get them to stick,” said Wheaton, a beaver expert who has consulted on the Red Butte project. Today, monitoring equipment, solar panels, bird nets and cameras occupy the canyon as part of long-term research into its hydrology and wildlife. Would the sudden reappearance of beaver dams disrupt this data gathering? The beaver proposal gives some researchers pause. She heads the U.’s Global Change and Sustainability Center, which has initiated and managed several research projects in the canyon over the past five years. For its part, Salt Lake City Public Utilities, which recently acquired the canyon’s dam from the Central Utah Water Conservancy District, intends to reserve the right to evict beavers from the reservoir if their activities threaten its operations. But officials have endorsed Shea’s project in official correspondence with the Forest Service. 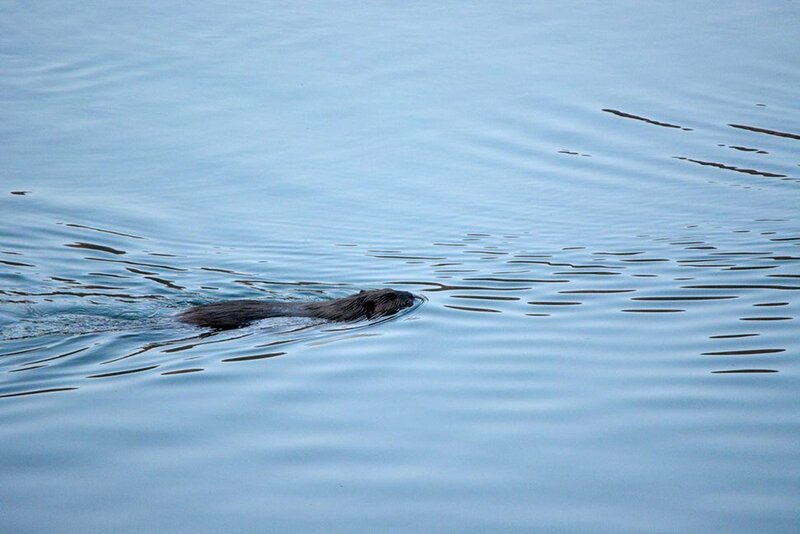 A lone beaver has been observed in Red Butte Reservoir, pictured here on April 26, a mile east of the University of Utah in the Red Butte Canyon Research Natural Area, where beavers were extirpated in 1982. U. biologists propose reintroducing the rodent, considered a keystone species in Western mountains because its dam building creates wetland habitat that supports many other native species. However, officials at the U. 's Red Butte Garden, a botanical preserve at the mouth of the canyon, fear beavers could migrate downstream and damage the gardens' trees. Photo courtesy of Sherwood Casjens. “It is important that we participate in research that helps us manage those ecosystems for all those services we depend on, clean water and flood control,” said utilities director Laura Briefer. Meanwhile, beavers are already recolonizing the canyons without human help. On April 26, birder Sherwood Casjens photographed one swimming the reservoir, barely a mile above the garden. Another Utah school district plans to raise teacher salaries. But will $43,500 be enough to keep up?